SINGAPORE - Former senior diplomat Kishore Mahbubani, who has led the Lee Kuan Yew School of Public Policy since it was founded in 2004, will be stepping down as its dean on Dec 31. His departure comes after 13 years at the helm, when the school – set up to serve as a training ground for Asia’s future policymakers, among other goals – cemented its reputation as a pre-eminent public policy school globally, said fellow public intellectuals. However, his term was also marked by some recent controversies, most notably when one of the school’s senior academics, Dr Huang Jing, was identified as “an agent of influence of a foreign country” by the Government and expelled. In a statement to the school’s governing board, Prof Mahbubani said “the time had come for me to take a fresh look at what I should achieve over the next decade as I enter my 70s”. Calling it a new direction in his life, he wrote that he wanted to “focus on a new career that involves more time spent on reading, reflection and writing” after 46 years in administrative positions. He previously served 33 years in the Singapore foreign service. He was also the permanent secretary at the Ministry of Foreign Affairs from 1993 to 1998. “I need to rebuild my store of intellectual capital, if I am to carry my writing up to a higher level,” said the NUS alumnus, who underwent a double heart bypass surgery last year. 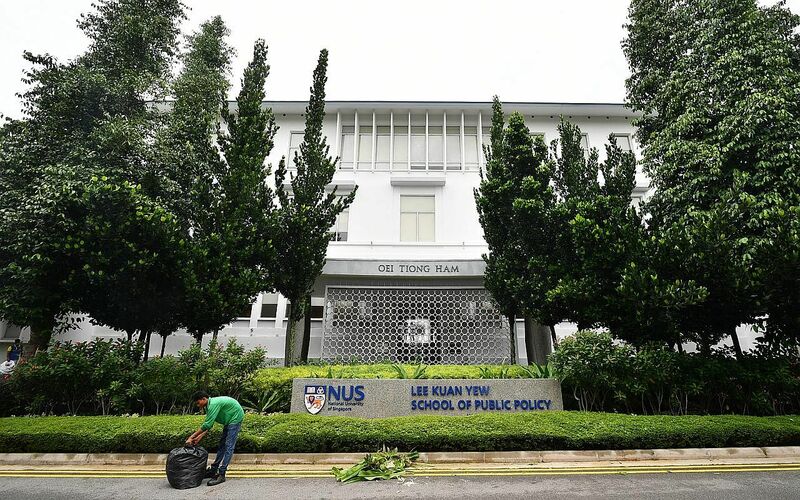 The university said that during Prof Mahbubani’s tenure, the school developed a strong international reputation as Asia’s leading public policy school and as a thought leader in key areas of public policy research. Calling Prof Mahbubani one of Singapore’s “star diplomats”, Ambassador-at-Large Tommy Koh told The Straits Times that he leaves two major legacies, both as a diplomat and as the public policy school dean. “He has, in a very short time, put the LKYSPP on the world map of the leading public policy schools of the world. He has also raised a very considerable amount of money as endowment and the school, I think, is financially secure for the future. He has also recruited some world-class scholars. So, in all three respects, we are greatly indebted to him,” said Professor Koh. As a writer, Prof Mahbubani – whose first book, in 1998, was titled Can Asians Think? – has never shied away from provocative topics. In a piece he wrote in The Straits Times in July – “Qatar: Big lessons from a small country” – he said pointedly that an eternal rule of geopolitics is that “small states must behave like small states”. It drew sharp criticism from senior diplomats Bilahari Kausikan and Ong Keng Yong, as well as Law and Home Affairs Minister K. Shanmugam, who said Prof Mahbubani’s assertion ran contrary to some of founding prime minister Lee Kuan Yew’s basic principles that made Singapore successful. “Mr Lee never advocated cravenness or thinking small. Did we get to where we are now by thinking ‘small’? No,” Mr Shanmugam wrote.